Action-puzzle excitement heads to the stars in this uniquely original challenge. Space waste management may not sound like the most exciting career in the universe, but Zzed had to take the job to be able to marry his lovely green alien sweetheart. At the time, he did not know that his boss was one of the most corrupt extraterrestrials west of Sirius. Will he get in trouble or will he get sent away to the farthest corners of his galaxy? Well, even alien love stories need to have a happy ending. 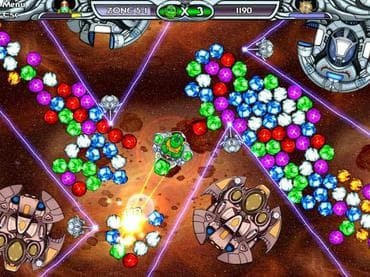 Zzed Features: - 60 Thrilling Levels; - Loveable Characters and Storyline; - Addictive Gameplay; - Amazing Graphics and Sounds. If you have questions about Zzed game, please contact us using this form.